Honda launched an Electric Vehicle Demonstration Program with Torrance Mayor Frank Scotto and American Honda Motor Co., Inc. President and CEO, Tetsuo Iwamura, conducting the first public test drive of a Fit EV prototype and an Accord Sedan test vehicle outfitted with a new two-motor plug-in hybrid system. The city of Torrance along with Stanford University and Google Inc., will each receive a Fit EV for testing starting in 2011. In addition, the city of Torrance will test a plug-in hybrid as a part of the program in 2012. Each of the three demonstration program participants will conduct general testing as well as evaluating specific and distinct issues related to the introduction of electric vehicles. "The goal of the Honda Electric Vehicle Demonstration Program is to more fully understand the challenges and opportunities associated with such a fundamental shift in technology," said Tetsuo Iwamura, American Honda Motor Co, Inc., President and CEO. "The city of Torrance and the other participants will play a key role, by providing real-world feedback on their experience. They will help us tackle the important issues surrounding customer adoption of electric vehicles." When the city of Torrance receives their Fit EV and plug-in hybrid, they will be evaluating the technologies with a focus on charging infrastructure development, promotion of sustainable community initiatives and to building public awareness about electric vehicles. The Fit EV and plug-in hybrid will be used by several Torrance city departments, including the Community Development department and Public Works office, along with the Economic Development office. The Fit EV Concept made its world debut on November 17, 2010 at the Los Angeles Auto Show. The production Fit EV will be introduced to customers in the U.S. and Japan in 2012. The Fit EV is designed to meet the daily driving needs of the average metropolitan commuter and utilizes the same 5-passenger layout found in the popular Fit hatchback. The Fit EV will be powered by a lithium-ion battery and coaxial electric motor. The high-density motor, derived from the FCX Clarity fuel cell electric vehicle, delivers excellent efficiency and power while remaining quiet at high speeds. The Fit EV will have a top speed of 90 mph. Recharging the Fit EV can be accomplished in less than 12 hours when using a conventional 120-volt outlet, and less than six hours when using a 240-volt outlet. The Fit EV will achieve an estimated 100-mile driving range per charge using the US EPA LA41 city cycle (70 miles when applying EPA's adjustment factor). Driving range can be maximized by use of an innovative 3-mode electric drive system, adapted from the 2011 Honda CR-Z sport hybrid. The system allows the driver to select between Econ, Normal, and Sport to instantly and seamlessly change the driving experience to maximize efficiency or improve acceleration. Honda also unveiled a plug-in hybrid platform at the Los Angeles Auto Show, which showcased Honda's next-generation two-motor hybrid system. 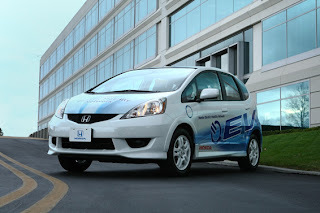 This new hybrid system is designed for mid-size to larger vehicles and will be introduced in a future Honda model in 2012. The plug-in hybrid is intended to be compatible with daily driving habits, allowing for short, frequent trips in all-electric mode, while providing long-distance driving capability when needed. The Honda two-motor system continuously moves through three different modes to maximize driving efficiency: all-electric, gasoline-electric and a unique, engine direct-drive mode. The plug-in hybrid also uses regenerative braking to charge the battery. In all-electric mode, the vehicle uses a 6kWh lithium-ion battery and a powerful 120 kW electric motor. The all-electric mode achieves a range of approximately 10-15 miles in city driving and a top speed of 62 mph. Fully recharging the battery will take 3 to 4 hours using a 120-volt outlet and 1 to 1.5 hours using a 240-volt outlet.